We knew we wanted to have ozōni, soup with mochi. I brought mochi back from mochitsuki, and though ozōni is normally made with a shoyu broth, I decided to make it with a miso broth. It ended up tasting pretty good, and I was lucky to have gotten the mochi the right consistency. We then decided to do some gaming. Kellen and Noël brought over their Playstation and Tynor played Journey, with me kibitzing next to him. Neither of us had seen it before, although we had heard a lot about it. It was fun to go through, and the music in it was great. 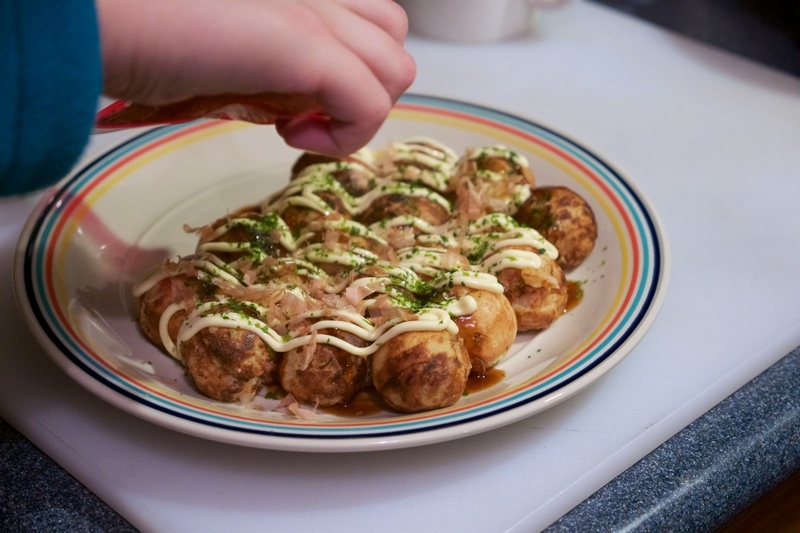 As we were finishing up, Noël and Kellen started making takoyaki; Noël had brought her takoyaki pan and the necessary groceries. It didn't take us long to go though them, even though she ended up making three batches. After Tynor finished Journey, I made some beef mac casserole (nothing close to tradition there) and we chatted over dinner and leftover Christmas cookies. We had a great time together; it was a perfect way to start the new year.